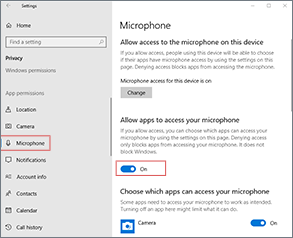 With Windows 10 version 1803 (April 2018 update) and version 1809 (October 2018 update), Microsoft changed the behavior of microphone app access setting so that it affects desktop applications as well. 2. Select Microphone and switch on the “Allow apps to access your microphone” toggle. 3. 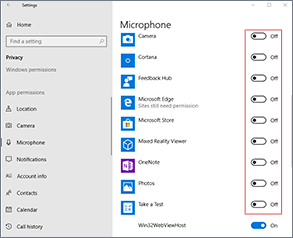 Under “Choose which apps can access your microphone” check that Win32WebViewHost (later renamed as “Desktop App Web Viewer”) is turned on as some desktop applications will need it. 4. Restart those applications where you’ve wanted to use the microphone. 5. (Optional) To block apps access to microphone you will have to toggle microphone off for each app. You will have to do this after each new app you install. 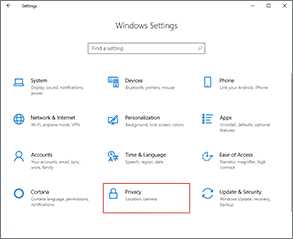 It’s recommended that you do not turn off microphone access for Win32WebViewHost (later named as “Desktop App Web Viewer”) as some desktop applications will need it. Useful for Skype, TeamSpeak, Discord, WhatsApp, Steam voice chat, OBS Studio, XSplit, Bandicam, Adobe Audition, Audacity, ocenaudio, Edge, Chrome, Firefox, Opera Facebook Messenger etc. Thanks to Shane and RatusNatus for the tips. Thank you! Don’t know why it did this but good lord it was driving me crazy. You, Sir, are a Godsent being! In my windows there are ONLY MS software to be allowed and Win32WebViewHost to everything else. I want to add that even the Mic test In Windows settings will not work without the Win32WebViewHost process allowed. I don’t know if this is new but I had to enable it to use the mic. Thank you for the info regarding Win32WebViewHost. It might be that the behavior has changed with later updates or I didn’t tested properly when Win32WebViewHost was set to off. Will check and make the proper changes. Jacob Frie: You, Sir, are a Godsent being!Thank you so much! Kiwi: Thank you so much. Stephen: Thank you! Don't know why it did this but good lord it was driving me crazy. letmeb: What if TeamSpeak is not listed as an app you can enable the microphone to use? FixThis: Completely agreed with “Sick of MS fkery”. Got the same situation. CarvedInside: Then the problem is from something else. Which Windows 10 version do you have?